One of a handful of places that locals claim was England's first seaside resort, Scarborough had been an important town since the 13th century, when the Scarborough Fair brought merchants from around Europe for a six week summer trade fair, but it was not until the 17th century when, a stream of acidic water was discovered that the town was reborn as Scarborough Spa and began to attract the first people for what we might identify today as a seaside holiday. The town's fortunes were significantly boosted in 1845, when the connection of the railway link to York coincided with the opening of the first hotel, the Crown Hotel at South Bay, followed by the opening of Grand Hotel - one of the largest in the world - in 1867. Though the town has had problems with coastal erosion, it has managed to avoid many of the issues of decline that have threatened other resorts and is still a popular destination, particularly with older crowds. 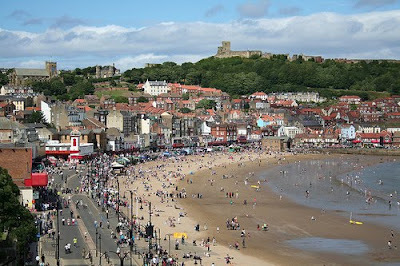 I also lived in Scarborough for a few months- its definitely ideal for a family holiday!